I had an interesting exchange today on Twitter with popular blogger and non-divisiveness guru Rachel Held Evans. 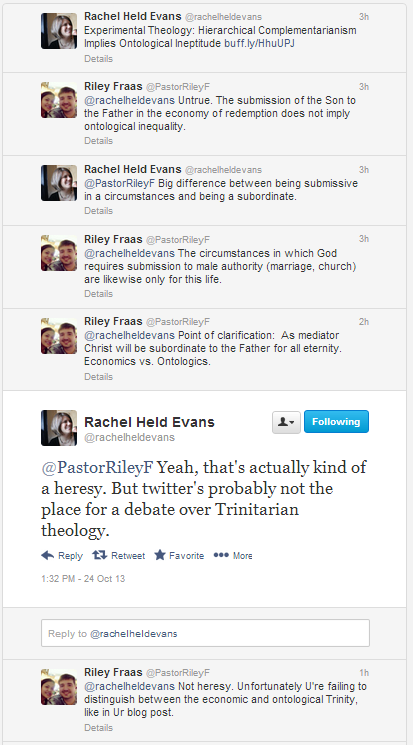 Now, let’s lay aside the fact that the eternal economic subordination of Christ to the Father has been recognized by all orthodox theologians since the Council of Chalcedon in 451 A. D. My first thought at being called heretic on Twitter by Rachel Held Evans was confusion. I mean, I thought we were just supposed to love and not divide over doctrine? It’s only angry, conservative, evangelical, racist, misogynist, homophobic white men with entitlement complexes who throw around the “H” bomb! (She has since tweeted me to the effect that she did not call me a heretic. She only said that I was communicating heresy. OK, semantics.) “Dude”, certainly not something you would expect from the post-evangelical, progressive, millenial spokeswoman. What is wrong with the position that Jesus (the second person of the trinity) is equal to the Father in essense while being subordinate to the father in His person? To deny such seems to move towards modalism where each of the persons are identical. If you are comfortable with saying that there are differences between the Persons of the trinity then why is it a problem having Jesus being Eternally submissive to the Father? Again, I was speaking economically here, not ontologically. My issue is that you seem to be saying that the ontological trinity is not what determines the economic trinity. The persons of the trinity are part of the ontology of the trinity. Because the persons are what they are outside of/before creation, we experience/know them in a certain way (economically). Jesus (the second person of the trinity) would be subordinate to the Father even without creation because that is simply the order of the Trinity. This is also why Jesus was sent instead of the Father, etc. Such however does not deny that the three persons of the trinity are equally God.